Microsoft has revealed that Windows 8 (Windows 8 review) doesn't support the playback of DVD and Bluray movies, and if you want to play DVD on Windows 8, you have to pay for the Windows Media Center Pack. This is not favorable to most people who are used to playing DVD movies on Windows computer directly and for free. Is there nothing we can do unless paying for Microsoft to play DVD on Windows 8 computer? No, there are other ways that can work for us, for example, converting DVD to Windows Media Player supported video format like WMV with a nice DVD to WMV ripper. Then you can enjoy your DVD movies via Windows Media Player on Windows 8 directly. There are many DVD to WMV rippers you can find in the market. Here we recommend you a professional ripper - WinX DVD Ripper Platinum that can rip DVD to WMV for Windows 8 within very simple steps. Step1. Download WinX DVD Ripper Platinum and launch it on your Windows 8 OS computer. Step2. Insert a DVD movie to your computer. Click DVD Disc button to load the movie. Step3. All DVD titles will be listed soon and the main title will be selected automatically. Meanwhile, the Output Profile dialogue appears. Move to PC General Video category and select WMV Video as output format. Step4. After setting destination folder by hitting Browse button, click RUN button to start ripping DVD to WMV on Windows 8. The whole ripping process will finish within a few minutes only. Find the output WMV video in the output folder and you can play it on Media Player. Windows Media Player also supports AVI and MOV video. So you can also convert and rip DVD movies to AVI and MOV video first and then enjoy DVD movies on Windows 8 directly. 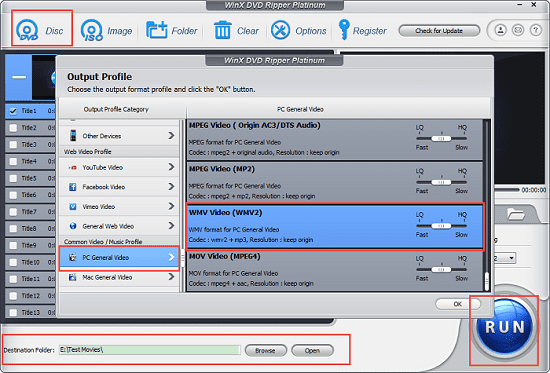 WinX DVD Ripper Platinum can help you to do it as easily as ripping DVD to WMV. You can give it a try on this wonderful DVD ripper as well.